Plot Outline: Mikey Walsh and Brandon Walsh are brothers whose family is preparing to move because developers want to build a golf course in the place of their neighborhood -- unless enough money is raised to stop the construction of the golf course, and that's quite doubtful. 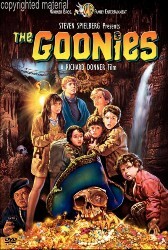 But when Mikey stumbles upon a treasure map of the famed "One-Eyed" Willy's hidden fortune, Mikey, Brandon, and their friends Lawrence "Chunk" Cohen, Clark "Mouth" Devereaux, Andrea "Andy" Carmichael, Stefanie "Stef" Steinbrenner, and Richard "Data" Wang, calling themselves The Goonies, set out on a quest to find the treasure in hopes of saving their neighborhood. The treasure is in a cavern, but the entrance to the cavern is under the house of evil thief Mama Fratelli and her sons Jake Fratelli, Francis Fratelli, and the severely disfigured Lotney "Sloth" Fratelli. Sloth befriends the Goonies and decides to help them.